Egg trees began appearing in my native Pennsylvania around 1960, when I was eleven. As I grew into my teens and twenties, I snickered over this new kind of lawn art. For one thing, the egg tree was not a genuine folk expression, but an artifice perpetrated by the Ladies Home Journal and House Beautiful. For another, the egg tree was favored by people of poor taste. "Trash," my grandmother called them. They usually had a flock of unruly children (like the ones my parents had), and under their egg tree they invariably tied an inflatable lavender rabbit that was quickly blown upside-down by the wind. Here in Connecticut 50 years later, I see a different kind of egg tree—understated, simpler, and often as affecting as this one. It's on King Street, at a house owned by a couple who maintain a splendid rock garden that I am sure you will see later on this page. 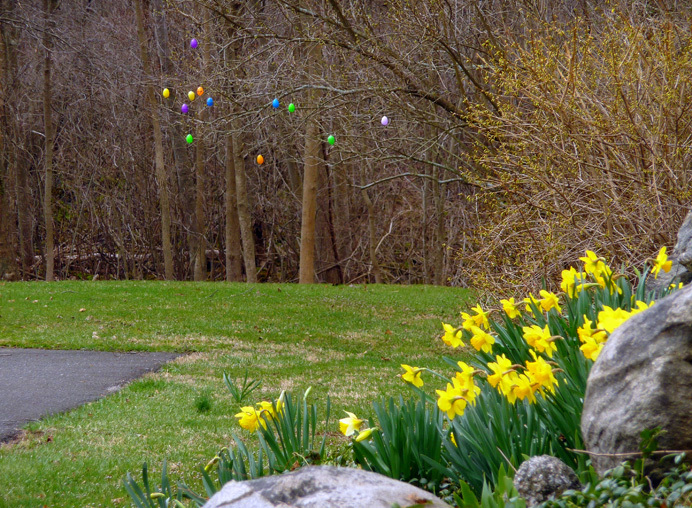 I saw them hanging the eggs when I passed this way on Sunday, but something told me not to disturb them. Gray-haired like me, they stood shoulder to shoulder and quietly talked as they placed the eggs. Counting these colorful pendants now—an even dozen, with two of each color but an extra green and a missing lavender—I wonder if each might celebrate a grandchild. Over this I do not snicker, but marvel and pray.